This week, I am still knitting the February Doll Sweater, but I also started another baby hat. This one being much more basic than the Cute Noggin Baby Hat. This one is called the Hospital Hat, and it is straight stockinette knitting with a garter stitch border and a little tied I-cord at the top. When I was selecting yarn for the Cute Noggin hat, I saw some pretty brown yarn that I almost purchased (but didn’t). When my first son was born, he wore a few brown baby garments, and I just really liked the way brown suited his boyish look. So, with this new baby boy, I thought a little brown cap would be adorable. Well, one night when I couldn’t sleep, I was looking through my yarn stash and realized I already had some brown yarn from a sweet blogging pal. (Yeah! So glad I didn’t buy more!) It is Lava Heather from Knit Picks. How to Make an Apple Pie and See the World is new to us this season. And it is so charming and funny. We haven’t actually made an apple pie yet this fall, as I am still trying to carve out some time to make apple bread. (There just aren’t enough hours in the day, at least hours that I can stand on my swollen feet in the kitchen! LOL) But my children giggle every time we read this, and it’s fun that there is a bit of geography woven throughout the story, too. For more Yarn Alongs, visit Ginny. Love the brown yarn. Silly but brown is one of my favorite colors. So natural and warm. Thanks for the link to the apple bread. We have made pies and crisp and need something different to do with our apples stash. That doll sweater is ADORABLE! I may he to try it too… my mind is all on Christmas these days! Girl…you are ROCKIN' it! I'll be lucky if I get one homemade thing done for the baby. That book sounds like fun! Hi Sarah, I'm really glad you are still finding yarn that you can use from that stash I sent! I've been wanting to participate in the Yarn-a-long, but as you know, I'm a little consumed with the twins right now! 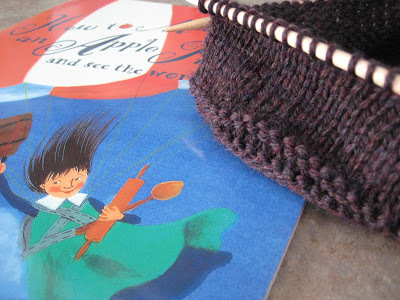 Love the brown wool you are using 🙂 I was just reading some more of your blog and I can't wait to make a pair of the pink fingerless gloves that you made for your daughter. I have a little girl to that will just LOVE them 🙂 Have a wonderful week.